A Tesla Model X owner had the vehicle’s Autopilot system engaged when the all-electric SUV crashed on a California highway, Tesla confirmed on Friday while alleging the driver who died in the crash missed key warnings to take control of the car. Prior to the March 23 collision, Tesla said the Model X owner had Autopilot engaged with adaptive cruise control follow-distance set to a minimum. The driver, Walter Huang, had received “several visual and one audible hands-on warning” earlier in the drive. Huang’s hands weren’t detected on the wheel six seconds prior to the collision, Tesla said. Huang died in the crash. “The driver had about five seconds and 150 meters of unobstructed view of the concrete divider with the crushed crash attenuator, but the vehicle logs show that no action was taken,” Tesla wrote in a blog post late Friday. 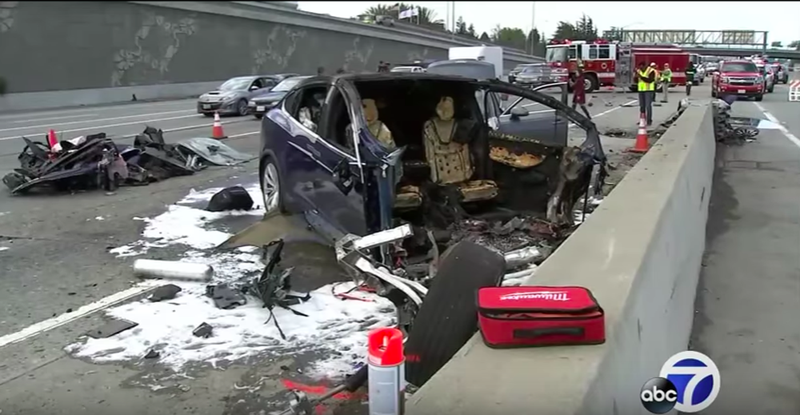 Tesla said it believes the crash was severe because the “crash attenuator,” a highway safety barrier which is designed to reduce the impact into a concrete lane divider, had been crushed in a prior accident without being replaced. “We have never seen this level of damage to a Model X in any other crash,” the company said. The confirmation that Tesla’s Autopilot system was engaged at the time of the crash comes amid a troubling time for the nascent self-driving car industry. This month, an Uber-owned self-driving car fatally struck a pedestrian, raising significant questions about the safety of automated driving technology. Following the fiery crash involving the Model X driver, the National Transportation Safety Board launched an investigation that’s expected to take months to complete. The Model X crash is the third known fatality to occur when Autopilot was engaged. In January 2016, 23-year-old Gao Yaning died while driving a Model S on a highway in China, and his family’s attorney recently told Jalopnik that Tesla’s own data confirmed Autopilot was engaged at the time. A half-year later, Joshua Brown died in Florida after his Model S crashed into a truck. The NTSB said an over-reliance on Autopilot was partly to blame in that crash. “Our hearts are with the family and friends who have been affected by this tragedy,” the company said. The NTSB initially said it wasn’t clear if Autopilot was engaged at the time it sent investigators to the scene earlier this week. But the confirmation that Autopilot was on should only add more questions for an industry currently trying to untangle how to approach self-driving cars in wake of this month’s fatal Uber crash, the first known to involve a pedestrian and an autonomous car. Update, March 31, 9:50 a.m.: This post has been updated to include more information about previous fatal crashes that occurred when Autopilot was engaged.